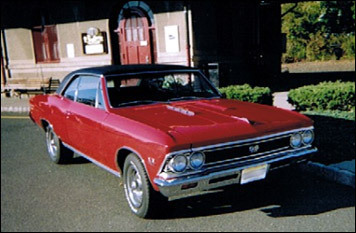 It’s not often you find a car like this with such low mileage, but this 1966 Chevelle SS was just barely broken in with 44,000 miles on the odometer when Mike was able to snag it from the original owner. Originally built in Baltimore, MD on March 24, 1966, this car was optioned the right way from the factory with the 375 hp 396 engine, black vinyl bucket interior, factory console, gauge package, and 6,000 rpm knee-kicker tach. Mike added the safety upgrades to modernize the a little bit with front disc brakes and power steering. He also added a Grant steering wheel to give more of a performance look. After a 5 year “frame off, ground up” restoration, the car was repainted in the original Regal Red thanks to Mike’s buddies Kurt and James at Automotive Dreams and finished off with a black vinyl top. Mike says, “A lot of blood, sweat, and tears went into this project and I am thankful for the assistance of your representatives who were instrumental in helping me get the many parts I needed. We know the feeling too, and keeping the heritage alive is why we’re here! Your car came out awesome, Mike, and we hope to see more and more people do the same thing that you did!